As a former athlete, I used to consume this common, so called “healthy” sports drink on a daily basis. It wasn’t such a big deal since I was doing vigorous exercising every single day at the ice skating rink or at the gym. However, for most people sports drinks should be avoided at all costs if you want to be healthier and lose weight. I was burning thousands of calories each day that it wasn’t an issue. However, the problem I see all the time is that people are drinking this “healthy” sports drink because it just tastes good or because they think it’s healthy for them. The drink I’m referring to is Gatorade or its’ friends Vitamin Water and Powerade. Unfortunately if you’re not a pro athlete working out for multiple hours a day, then you’re going to skyrocketing your blood sugar levels. 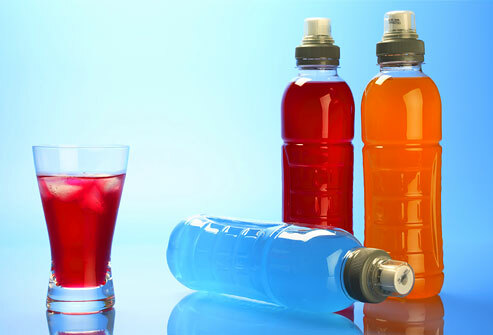 High blood pressure and ultimately weight gain are also side effects of drinking these sports drinks. Even teammates on my hockey team that were exercising every day would complain that they couldn’t drink too many sports drinks because it would cause them to gain weight, which would make them skate slower, which would hurt performance. You guessed it, they gain unwanted weight and their health starts to decline from ingesting all the toxins these drinks have in them. There are flavoring agents, natural flavors, high levels of sugar, and many other unhealthy ingredients added. Now that you can see the effects of Gatorade affecting athletes and weight gain, I’m sure you can imagine the negative effects the average person has. Many people believe these drinks are healthy for them because they see athletes drinking them. Turn on the football game and Gatorade logos are plastered all over the sidelines and the bucket gets dumped on the coaches head. Sports drinks confuse lot’s of men and women. If you’re into sports drinks or like fruity drinks that have flavor, then you may not be a big fan of water and that’s why you’re drinking a sports drink. If this is the case and you think your water needs more flavor then give lemon water a try. Many of the people I have worked with who have a hard time drinking plain water tend to drink lots of sugary drinks. Try to lean off these drinks slowly and transition over to water. It’ll make you feel much better with increased energy levels. I always ask for a lemon with my water when i’m out to eat, or if I’m at home I always have lemons on hand. You can even make a healthy and delicious lemonade that will contains tons of antioxidants… Slashing your sugar cravings. Do you like to drink water or do you add lemons or fruits to it? Let’s talk about it in the comments section below.